The Daddy Of Big Sale: Flipkart’s Big Billion SaleBrand New Look Of Snapdeal’s Website & AppOnePlus 2 Will Have USB Type-C Port (Official)BlackBerry And Android Smartphone? Here Is What We Know So Far! When I heard about this news first I thought it was from SanDisk, but alas, it is a different brand this time and beware, it is extremely costly. We came across various brands displaying their products at Computex for the past few days, some surprised us and some disappointed us, but this one from Microdia gave us something else. 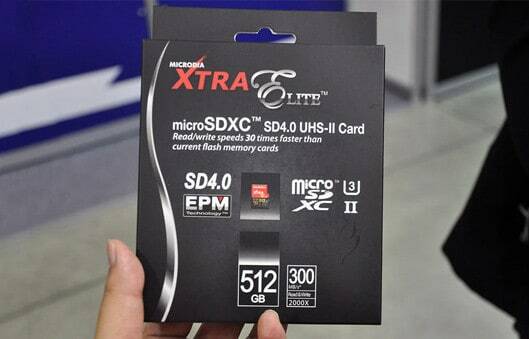 They unveiled the world’s first 512GB microSD card. They somehow managed to cram 512GB into this tiny device. Must appreciate them for that. Microdia said it estimates that Xtra Elite will cost around $1,000. You can actually buy a good smartphone for that price, but apart from that, it’ll take some time for smartphones to have this compatibility. The good news is Android M is kinda love with microSD cards and they’ll provide proper support to them. The Xtra Elite will use version 4.0 of the Secure Digital (SD) standard and it will also feature an Ultra High Speed (UHS) bus with data transfer rates of up to 300MBps. SanDisk’s current highest capacity microSD card is 200GB (Microdia provides double the storage space) but I’m pretty sure they’ll launch an upgraded version soon, but the point is, do we really need it? Do let us know your views in the comments below.